It’s time for another addition of Meet Your Monger! We stand behind the counter, asking you to try this and that, but who are we really? I, Kiri, pose questions to the crew here at the Cheese Shop and see what they have to say. This week: Joe the Charcuterie Maven. You’ll spot him slinging charcuterie on Sundays. What draws you to charcuterie? How did you get into the charcuterie business? I fell into it in when I helped open the Cheese Shop and was backing for a couple months and Sundays. Basically, because of my schedule, charcuterie was easier to learn than all the hundreds of cheeses. So that’s where I ended up. Tell me a food memory you have. Growing up, I was never into cooking or anything like that, but my mom always made banana bread that I loved. It was the banana bread of my childhood. When we moved or a little bit after that, my mom lost the recipe to it. But then in college with my friend Ashley, we found this banana bread recipe that for all intents and purposes was the same recipe! We added the brown sugar, white sugar and cinnamon top of it. And that’s my banana bread recipe today, and I get nostalgic remembering that recipe, of losing it, then finding it again. I will brag about that banana bread ‘til the day I die. So essentially, it’s your mom’s banana bread, even though it’s not. It sent you on a quest. Yeah. At the very least, to get that taste back. When you’re not at the Cheese Shop behind the charcuterie counter, you are a track coach. Which meat in the case represents a sprint? Which meat represents a marathon? The marathon is definitely the Jamón Ibérico because it is aged the longest. The sprint might be the Zoe’s Ghost Pepper Salami because for the spice to build, you have to eat more and more of it quickly, and then it’s a quick flash in the pan, and the spice goes away pretty quickly. 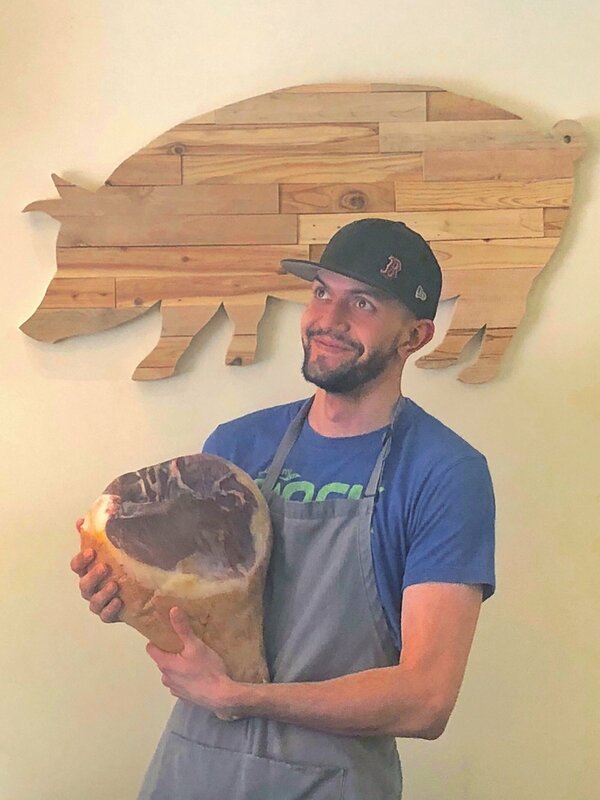 As our resident artist (Joe made the giant wooden wine bottle in the wine section and the wooden pig in the charcuterie section), what is your next project for the shop? I think I need to make goat and cow ones for the cheese area. Oh yeah, I forgot about sheep. I feel like sheep have less of a distinctive shape. Maybe I’ll do a Wallace and Grommet sheep complete with googly eyes. [I laugh hard at this one. Joe does not.] I want to make some states too, but that’s not for the shop. If this were the cheese high school yearbook, what cheese that we’ve had in our case would win best team player? I feel like it might be the Kaltbach Le Cremeux [Alpine-style cheese from Switzerland] because it can be melty, it can be good just plain on a cheese board. It fits a lot of different scenarios and it never complains. I feel like the Capri [a goat cheese from Hubbardston, MA] because it’s bright and fresh. I feel like if I chose a blue I’d get sick of it pretty quickly. It would be kind of weird on a hot day. But a bright cheese would be nice and go with fruity foods. I know Princess Bride is one of your favorite movies. What meat, cheese, and drink would you pair with the movie? I’d pair them to Andre the Giant, Mandy Patinkin and Wallace Shawn [Fezzik, Inigo Montoya, and Vasini in the movie]. The wine would have to be Sicilian, like Vasini, because as we all know the two greatest blunders are “’to never get involved in a land war in Asia, but only slightly less well known is this: ‘Never go in against a Sicilian when death is on the line!’” The meat would be Spanish, so I might go with Coppa in honor of Inigo Montoya whose father was the greatest swords maker in Spain. While I don’t think we have any Greenland cheeses for Fezzik [the giant] I feel like something with big flavor and a little earthy would be a good choice there. So maybe like the Wrängbäck, that big Swedish one that sits in the back.